All training dates are usually on weekends (Friday-Sunday) so if you have a busy schedule, you can still come! Trainings usually begin at 9 or 10 AM, and end at 5 or 6 PM. Combination Tuition (Hypnosis + NLP certification) – Call us for price (Best option). Call 301-717-1207. Put your deposit in today! Schedule conflict with one of the listed dates? Contact us to find out if you can still attend. Call us today at (301) 717-1207 to complete your phone interview and to reserve your space in our next training class. Join us for a Reiki Certification Training on the weekend of September 15th. Reiki is an ancient Japanese method of healing using Universal Life Force energy to balance the body and mind. It works on all levels – physical, emotional, mental, and spiritual – enhancing everything in life. Anyone can learn Reiki. Anyone can give Reiki after a series on Attunements given by a Reiki Master. Reiki is not a religion or a cult. It is not affiliated with any religious dogma, hence allowing people from all walks of life to learn it. Reiki can be enjoyed by everyone – adults, children, and pets! It brings inner peace and harmony. A sense of calm during times of stress. It helps with the grieving process allowing one to regain emotional balance. Reiki can provide relief from migraines, arthritis, menopausal symptoms, and insomnia, to name a few. It also helps with accelerated healing following surgery, and diminishes the side effects of chemotherapy and radiation. Reiki strengths the immune system, and is used in over 800 US hospitals in conjunction with traditional treatments. Reiki is an awakening, a new way of looking and feeling about ourselves and everything around us if we allow ourselves to remain open to the energy. The sharing of this powerful energy fills the heart with light and warmth. 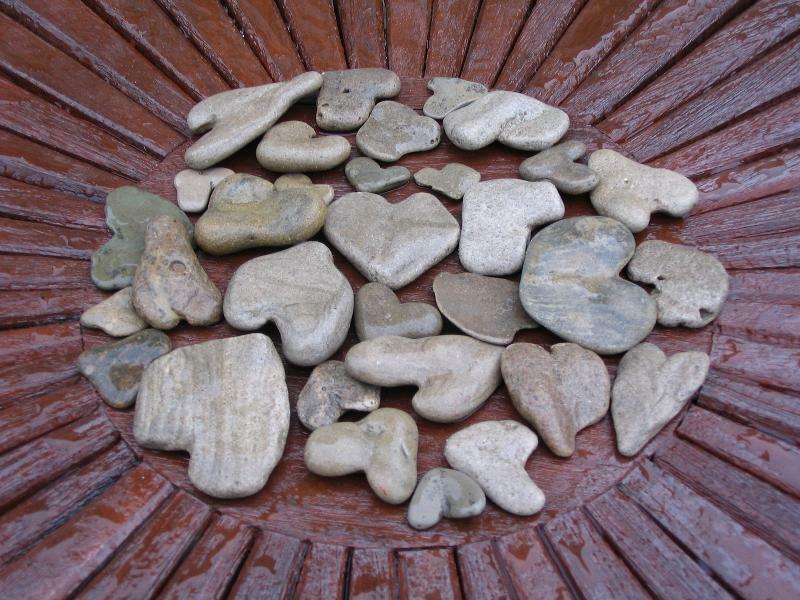 Reiki is the very essence of love. Denise von Hengst was born in New York City, but raised in Geneva, Switzerland. She is a natural born healer, a wife, a mother, a mystic, a Reiki Master/Teacher, and an author. Her book, Sacred Circle, available on Amazon, demonstrates how Denise challenged her own beliefs, ultimately finding a more spiritually fulfilling life. She is a woman of deep compassion, lovingly guided by Spirit. She was the founder of DC’s Christmas for the Homeless in the later 80’s, which brought the plight of the homeless out of the shadows encouraging chefs and restaurants around the nation to help feed the hungry. Denise was also the creator of Sisters of Steel, an international online group inspiring women to pursue their dreams, be healthy role models for their children, and live with mental and physical strength. Wishing to pay forward the gifts of life that she’d be blessed with after surviving cancer in 2013, she embarked on a compassion driven journey to assist the Syrian refugees washing up on the shores of the island of Lesvos, Greece. As always in the past, Spirit intervened in making desire to help a reality. Denise believes in unconditional love, the gift of hope, the power of belief, the outstretched hand, and the open mind to heal. She is a student of Buddhism, finding joy, peace, and a kinder more gentle world within the wall of the temple. When time permits, she loves to travel to places far and wide. Learning about different foods, cultures, people, and beliefs is a passion. This world traveler unpacks her suitcases in Rockville, Maryland. It begins with the symbol (kangi) for Reiki. We break it down for better understanding of the origin, how and why. Then we go into the actual history of Reiki. There were three major teachers who brought something new to the practice helping it evolve. Their stories are very interesting. In addition to these stories, each student will be given the time to share their own personal journey. Sharing works to create connections, bonding, and trust in each other and the teacher. We will learn the five spiritual principles of Reiki. After lunch we will have a lovely meditation. Then each student will become aware of the world of energy which is all around us and within us. Reiki I is primarily about feeling that energy. We will learn the various hand positions, key to Reiki. Each student will begin to learn how to do Reiki on themselves. The objective is for each student to clear themselves – opening channels for the universal life force energy to flow through them. Students will begin to receive and give treatments for the first time on each other. This is often a great time of astonishment as students become aware of strange new sensations passing through their hands and elsewhere. Reiki I is primarily about feeling that energy. We will learn the various hand positions, key to Reiki. By the end of the weekend, each student will have the ability to work on themselves or close family members using the hand positions along with the first Reiki symbol passed along during an attunement. It is recommended that the student practice on themselves or close family for three month. 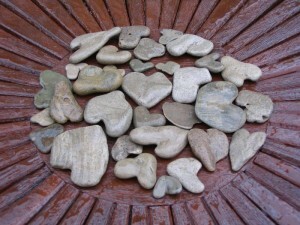 This gives students time to rebalance before beginning Reiki 2. This day will begin with a brief study of the body energy centers, the seven Chakras. We will speak of intuition, attachments, and protecting and clearing ourselves of outside energies. There will be more attunements as each student will be introduced to the very powerful symbols. Each symbol has specific function. Students will learn to use Reiki on a much deeper level. We will also learn that Reiki is is not restricted to space – that healing energy can connect us to people, places, etc. We learn to focus our intentions. In the end we will talk about setting up their own practices. If the student wishes to go forward with studies towards becoming a Reiki Master they must work on others for at six months. Each person worked on must be recorded in a diary. What is Included in the Level 1 Weekend? If you are looking to deepen your connection with this universal energy, this is the perfect class for you. I hope you’ll join me! Fill out the form below for more information, or call us at (301)717-1207 to sign up. Fill out this form to request more information or sign up to the Reiki Training Classes. Effective teams have key things in common – at least four key imperatives. Top organizations have clear-cut objectives, they have their systems and processes aligned with those objectives, their members are engaged, and they have high levels of trust. The organizations that have these four things in common are innovative, they are productive, and they seem to be doing well. Those that don’t have these essential behaviors aren’t doing that great – people are just showing up. The difference between having and not having these four imperatives in your organization is a mindset and paradigm shift that comes from the inside. These essentials represent a core set of ideals that make the difference in whether a team is effective at reaching its goals, or if it seems to never quite get there – no matter how many resources are thrown at it. A handful of highly evolved organizations have figured out that more training, more information, and even more technology aren’t yielding the desired results in their organization. Traditional lectures, workshops, online courses, and other solely cognitive activities aren’t helping workers who are already dealing with information overload. Instead, these workers need a new, transformational paradigm that relies on experience, not mere knowledge. One way we help organizations do just this is to help its employees manage stress more effectively. Today’s organizations require new competencies and new thinking to succeed. When companies engage us, I identify through a confidential and anonymous survey how the organization or team ranks on several key factors that the research has shown is significant in developing a better working team. After getting the results of this survey we will explore together how to make your team more cohesive and adaptable, resulting in an increase in productivity and bottom line results. To schedule your survey and assessment, contact us today. The Goulding SleepTalk® process is easy to learn, takes parents only a few minutes daily at bedtime, and it can’t be “done wrong”. It’s absolutely safe, ethical and positive. SleepTalk® is for people who are looking for a simple, non-intrusive self-esteem and behaviour change process for children that can help parents achieve what they want most – happy children and happy families. The process is about developing a child’s emotional resilience, the mind’s firewall, which protects against negative suggestions; much like a firewall on a computer protects it from outside interference and damage. 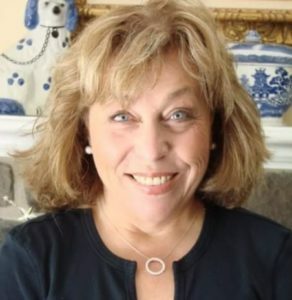 Join Joane Goulding, the creator of SleepTalk®, and Gary Johnson, an expert on Psycho-Nutrition, who are coming all the way from Australia to Washington DC for this exciting workshop. This is the very first SleepTalk® Consultant Training to be held in the United States! This course is for those who wish to work with parents of children or learning the process for their own children. As part of the course you will become a Certified Goulding SleepTalk® Consultant. 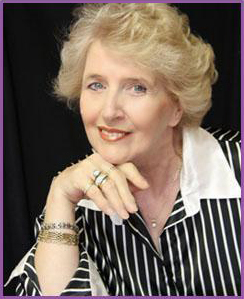 Joane is the director of The Goulding Institute and in 2011 was awarded the title: Hypnotherapist Emeritus by the PCHA. She is a Life Member of the AACHP and the ASCH. Since 1974 Joane has specialized in the biopsychosocial aspect of stress and mind management. Professional qualifications include Clinical Hypnotherapy, Counseling, Psychotherapy, Psycho-nutrition, Training and Assessment Systems. 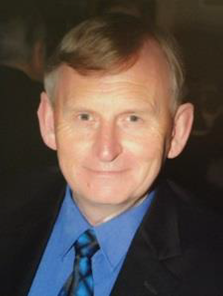 Gary Johnston has had 35 years of clinical experience in mental health, anxiety disorders, relationships and communication strategies, all backed by over 50 years research. He holds a Master’s Degree in Applied Social Science, a Graduate Diploma of Clinical Hypnotherapy and is a Master Timeline Therapy Practitioner. He is a Director of The Goulding Institute and GMF International, and a former director of the Australian National Hypnotherapy Register and President of the Council of Clinical Hypnotherapists. He is author of “The Neuro-Com Program”, “Creating the Ideal Relationship”, and “The I-Virus: Destroyer of Humanity”. Gary now spends most of his time writing and training mental health practitioners all over the world. I now have a little boy who is happy. “The change in him is unbelievable and I am so grateful to Joane who developed the SleepTalk process because I now have my beautiful little boy back and I now have the opportunity to help other parents out there that are struggling with their children too. “I wanted to say thanks again, the course was fascinating and I can’t put my training manual down! I want to learn as much as I can about SleepTalk. It was a little daunting at first when I saw the wealth of experience around the room but you made me feel like I was just as important which gave me the confidence to believe in myself. It had quite a profound effect on me on an emotional level. “I really want you to know how much I personally appreciated your Sleep Talk training and education. It had quite a profound effect on me on an emotional level. The idea that we as adults have the opportunity to heal the subconscious hidden trauma of our children without them actually being aware that they have a problem excites me. By attending all 4 days of the class and being deemed competed upon receipt of the required case history assignments, you will become an accredited Goulding SleepTalk® Consultant. You will receive an invitation to register and post your professional details onto the International Goulding SleepTalk® Consultants Register which is sponsored by the Goulding Institute. Analyze the framework of the Goulding SleepTalk™ process. Discuss the rationale behind the use of the Goulding SleepTalk™ process. Describe the basic considerations and assumptions of the Goulding SleepTalk™ process. Identify, discuss and analyze the ‘Legacy Tree’. Evaluate the relevancy and analyze SleepTalk™ feedback statements. Apply concepts and principles of waking suggestion and the rationale for presenting SleepTalk™ each night. Outline a frame of reference which will provide the desired changes in behavior. Formulate specific content of the ‘SleepTalk™ Foundation’ script. Propose and implement a process which integrates desired changes of behavior in a child. Formulate specific content of the ‘SleepTalk™ Primary area on need’ script. Propose and implement a process which will provide desired changes of behavior in a child. Describe how psycho-nutrition affects the relationship between the body and the mind and its relevance to a child’s behavior, levels of stress and/or anxiety. We spend most of our lives dealing with relationships and communicating with others. For something that is so fundamental to our personal, family and business lives, why are the statistics on stable relationships so dismal? In this presentation we will look at some of the more interesting statistical research and how that impacts our view of the world. We will look at relationships from a point of view of the Neuro-Com Mind Model and provide a proven multivariate model that explains all the possibilities and downsides of our connections and communications with others, with our children and business relationships. Gary will explore the role of pre-mature cognitive commitment to behaviors that affect how we communicate and connect with others, and why normal methods of couples or relationship counseling rarely provide a long term sustainable outcome. And finally we will explore the methodology and communication techniques required to create and maintain ideal relationships, whether they be personal, family or business. You will be provided with precise evaluation and intervention tools that are invaluable in your practice or for your personal situations. For learning outcomes, resource requirements, and assessment strategies along with detailed outlines of each course unit, contact us. Course Tuition and Certification is $789. Enter your name, email, and phone number below to request more information or sign up for the Goulding SleepTalk® Certification workshop. 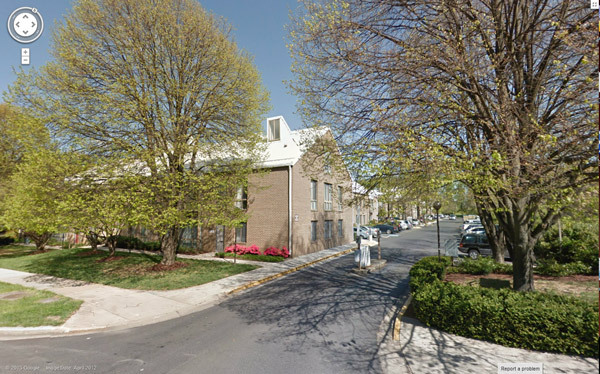 Our Maryland Hypnosis office is conveniently located in Rockville, Maryland. Located in “The Executive” Office Park on Executive Blvd., Close to Old Georgetown Road and Montrose Pkwy. Once you enter “The Executive” office park, park near the steps and walk up the steps in order to reach our office. We are the third office on the left, and our office has a red door. We also have a wheelchair-accessible pathway. Our location is metro-acccessible from the White Flint Metro Station on the Red Line. We are near I-495 and I-270, and you can easily reach our location from Northern Virginia, Washington DC, Baltimore, and other parts of Maryland. There is abundant free parking in our office complex, especially on nights and weekends. 6) Park near the entrance. Go up the stairs, and we are on your left. Our office has a red door. 4) After 2.5 miles, turn left onto Executive Blvd. 4) In half a mile, turn right onto E. Jefferson St.
5) The office complex will be on your left (see photos). Make a left turn into the office complex. 6) Parking lot directions: follow the parking lot until it stops; take a right keep going right until you turn into a lot of parking spaces that is slightly elevated. 7) Follow the pathway on your left to our center. 8) Our office will be on your right, and has a red door. 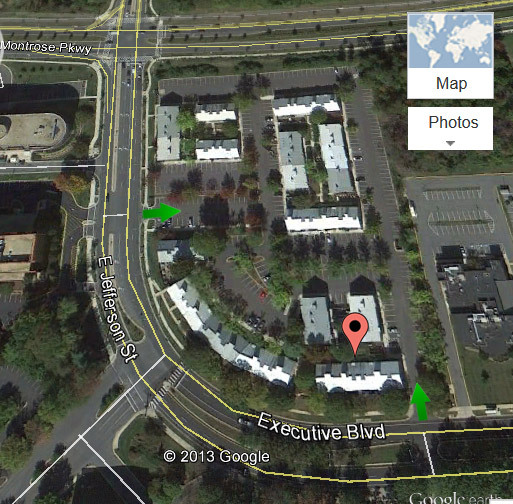 5) After 2.5 miles, turn left onto Executive Blvd. 7) Park near the entrance. Go up the stairs, and we are on your left. Our office has a red door. To download the forms for your session, Contact Us and we will send them to you. Please print out the forms and bring them with you to the session. If you have any questions you can call us at 301-717-1207. Thank you for choosing the Washington DC Hypnosis Center. Do you ever feel that your thoughts and emotions control you, rather than you controlling them? For some people it is a daily pattern to have general feelings of anxiousness or nervousness, with no visible reason. Others experience anxiousness in certain situations, such as public speaking, dating, or test taking. Whichever the situation, feelings of anxiety always have one thing in common: They are fears of something happening in the future. Some of these fears may be completely unconscious, and they “run” so fast in your mind that you aren’t even aware of them. The great news is that a person who has anxiety also must have a great imagination! In order to have that nervousness about something that may or may not happen in the future, you have to imagine it. Because your imagination is activated, this makes you a perfect candidate for hypnosis. With hypnosis, we will now begin to show you how to use your imagination in constructive and positive ways, not the negative ways of the past. You will learn how to trust the process and to just let go. If you would like to sign up for our program or if you have any questions, fill out this form and one of our hypnotists will call you back. 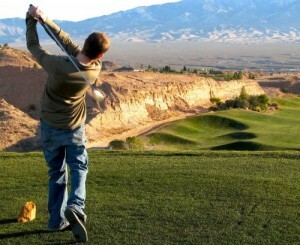 Who else wants to lower their handicap and to learn the mental game of Golf? Our Golf Improvement programs can help you to become more efficient athletically. We offer several hypnosis programs for losing weight and for maintaining that weight loss. This is not another Diet! Through the effects of hypnosis, you’ll eat less of the foods that you are currently eating, and you will have an increased desire to move your body. When you don’t feel that “pressure” to keep eating beyond what might be normal or natural for you, you’ll find the pounds melt off and you’ll have an increased sense of energy and a general sense of well-being. Call us to discuss on the phone. 703-779-9616 for Northern Virginia, or 301-717-1207 for Maryland. Choose the program that works for you. For a large group atmosphere, our group sessions are great for those who work well in group settings and who are trying out hypnosis. These sessions tend to be inexpensive and something you can do over and over, however you must be available at the times the group meets, and the suggestions given are the same for everyone who comes. If you are a “typical” weight reduction client, of which perhaps 40% of people we see fit into this category, then group sessions will work well for you. We recommend these group sessions either as your first introduction to hypnosis, or as something to do as reinforcement after the deeper work has been done. The Advanced Group was created to serve the crowd of people who want to go deeper in a group setting. This isn’t possible in a normal group because it’s a different crowd every time and some are new. However in the Advanced Group, you move through the process as a group, and you will get to experience deep and powerful changes as each person will get to transform their issues, challenges, or blockages. This allows a closer connection to those people in your group, and you get to see the real results that happen from week to week. Our individual sessions are the most popular weight loss program. In contrast to a group-centered approach, in these sessions we individually address your triggers and emotions that have been causing you to gain weight. Our weight loss program is a 5-session program, and in each session we are working with you personally to overcome challenges and blocks that may be stopping you from reducing the weight completely. Hypno-Band® is a combination of using hypnosis and behavioral changes to help you to understand and change your eating habits. Using hypnosis, a virtual gastric band is fitted to your stomach, causing you to eat less and less often.For more information about the program, visit our Hypno-Band® Page. You Have Tried Everything… How About Hypnosis? Through the Core Transformation process, these states become your new foundation for living. With these states uncovered in the specific way you’ll learn in the training, many limitations melt away, and even deeply-entrenched problems often unravel and dissolve. “Tamara is tops: In addition to her skill and smarts she projects warmth and caring. Through her extensive experience as a Core Transformation trainer she encompasses all the ins and outs, the variations and challenges, with grace, intelligence, and wisdom. Three full days gives time for both a thorough presentation and for plenty of experience with all the steps and aspects of the Core Transformation process, as an “explorer” using the process for your own transformation and as a guide for others. The inclusion of a half-day on the Aligned Perceptual Positions process is an added bonus that will expand and enrich your change work even more. “I highly recommend Tamara Andreas’s Core Transformation seminar. Tamara creates a supportive and caring environment from the very beginning. The breadth of her knowledge and experience in the process is awesome. 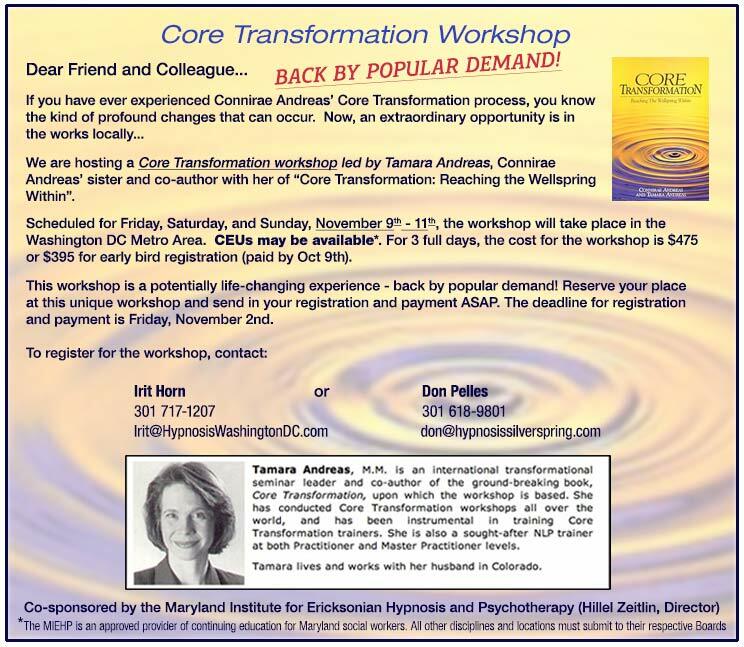 “I attended Tamara Andreas’ Core Transformation Training last Fall. It was one of the best trainings I have attended. The weekend was a life experience rather than an intellectual exercise. Finding a Quality Hypnotist Is Not! Sometimes those wishing to be hypnotized shop around for hypnotists, as if they are commodities. One hypnotist or hypnotherapist is as good as the other one, right? WRONG! Your hypnotist’s credentials, experience level, approach of techniques, and general personality, can have an enormous impact on the results that you get. … In fact, it can be the difference between getting your result and feeling fantastic, or going home saying, “I tried hypnosis, but it didn’t work for me.” Use this guide to choose the best hypnotist in Virginia (or Maryland and DC) that meets your needs. 1. Knowledge of Modern Hypnosis Techniques. You should always query any hypnotist that you are thinking of going to for what types of techniques they use to bring a person into hypnosis. What you want to hear is “Instant Induction,” “Rapid Induction,” or “Dave Elman Induction.” If they say “Progressive Relaxation” or a variation of someone telling you to relax, it is likely that the person is not very well trained and/or is not up to date on modern hypnosis techniques. Contrary to popular myth, hypnosis is not relaxation. 2. Experience Level. How long has the hypnotist been doing hypnosis for? While I’ve been practicing hypnosis for over 11 years, I’m surprised that some of my peers start clinical practice after as little as 3 months of experience! Quite honestly, it’s just not enough. You want to look for someone who has been in the hypnosis field for long enough to know their material completely. 3. Training and Credentials. As a Certified Instructor of Hypnosis, I know exactly what it takes to become a hypnotist, and I know how little training some of the people out there are getting from other schools. For example, did you know that some people can market themselves as hypnotists with as little as 3 days of training? Look for someone who has been to an in-person approved class, such as a National Guild of Hypnotists training, and who has taken steps to go beyond their training. All of the hypnotists at the Washington DC Hypnosis Center have attended in-person trainings with extensive practice that meet AND exceed the guidelines of the top hypnosis organizations. To ensure you are getting “the best of the best,” look for someone who has been recognized as a top member of their organization. Both Irit Horn and I have passed the NGH’s Board Certification exam and interview. 4. Respected By Their Peers. Hypnosis is a profession, just like any other profession. Do other hypnotists respect the person you are going to? In my first couple years as a hypnotist, one of the things I wanted to make sure to do was to network extensively and earn the trust and respect from some of the big names in the field. I’m proud to say that some of these people have now endorsed our training and services. Nothing could be less relaxing than that scenario! You must make sure that the hypnotist you choose works out of a professional office environment. Your doctor, lawyer, and dentist do not work out of their homes — and neither should your hypnotist. 7. A Compounding Approach. Although hypnosis has been portrayed in the media and television as a miracle done with magic wands, a one-session quick-fix almost never lasts in the long term. If you want the changes to last, the suggestions must be compounded and integrated over multiple sessions. I hope that this guide has been informative to you when you are choosing to get hypnosis in Virginia and in surrounding areas. If you would like to schedule an appointment with the Washington DC Hypnosis Center, please give us a call at 703-779-9616 for Virginia or 301-717-1207 for Maryland.